Elicia Aslin-Hummel’s interest in sculpture, modern art and design, popular culture, as well as traditional materials, allow her considerable subject matter for continued exploration and experimentation. She is attracted to the combination and the push-pull of the traditional and non-traditional, the rough and the fine, the risqué and mundane, the narrative and abstract, vessel and sculpture. It is in the spaces between where she prefers to dwell. Elicia became interested in ceramic sculpture as an undergraduate art student in Northern California, where her main focus was in foundry and welding. She found that working in clay allowed her the ability to work faster and more abundantly than she could ever work in metal. Looking to clay as a medium for creating sculpture was a natural progression. Her early work was primarily figurative and narrative and influenced by the west coast ceramic sculpture giants such as Robert Arneson, Viola Frey and Stephen Destabler. 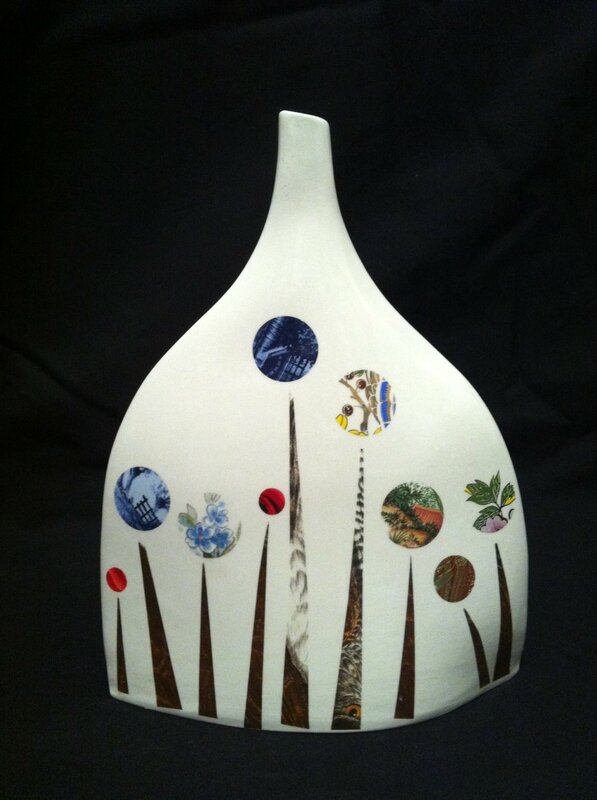 Her current work includes primarily hand built sculptural vessels in either earthenware or porcelain slips. 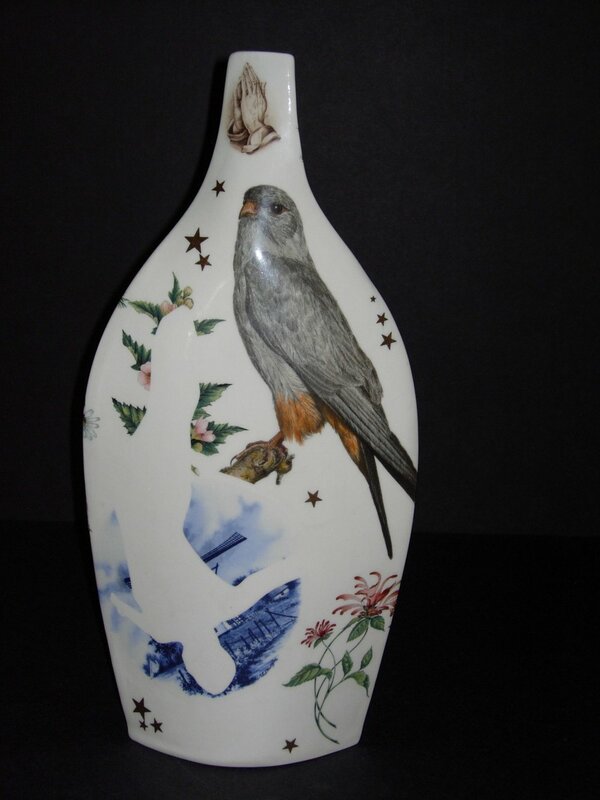 The surfaces incorporate a variety of glaze techniques sometimes combined with narrative collage or hard edge design elements that use traditional, often kitschy over glaze decals in unexpected ways. 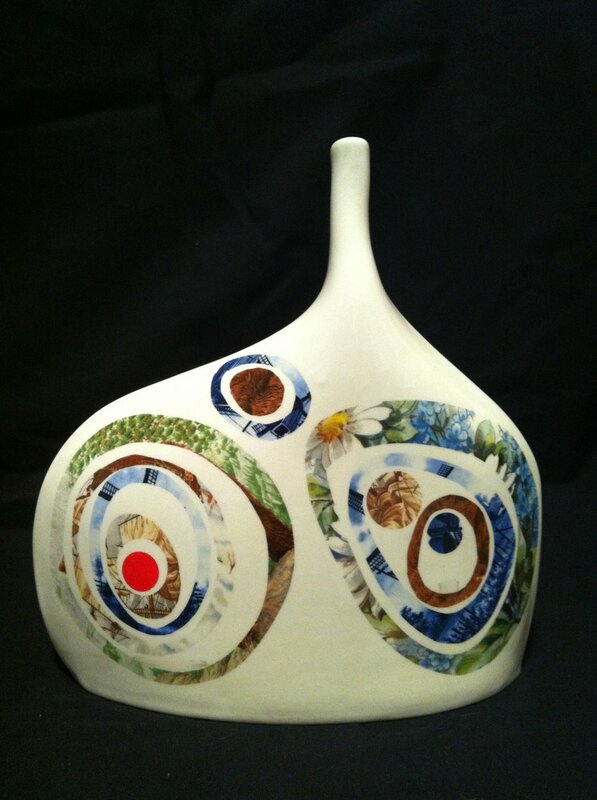 It wasn’t until she participated in a workshop with ceramic artist Charles Kraft that she became interested in the incorporation of ceramic decals and over glaze techniques, which she continues to work with today.